In 1967, two automotive engineers with a passion for motorsports began fine-tuning engines for Mercedes-Benz race cars in an old mill. Today, as the performance division of Mercedes-Benz, AMG creates some of the most sought-after vehicles in the world. They're the product of skilled craftsmen, designers and engineers who live to test the limits, and one shared conviction: on the road to driving performance, short cuts never win the race. Taking a look at our Mercedes-AMG inventory is the first step in experiencing power delivery, handling, and sound like no other vehicle on the road. We are Mercedes-Benz of El Paso, your luxury car dealer in the El Paso & surrounding Fort Bliss, Las Cruces, NM & West Texas areas! 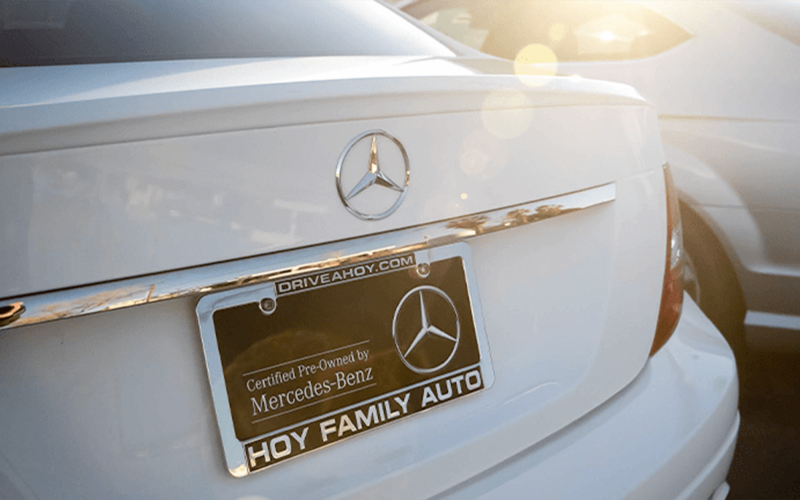 As part of Hoy Family Auto, we are proud to have served the TX & surrounding communities with luxury cars and service for over 40+ years! Formerly known as Hoy Fox Mercedes-Benz, we are now Hoy Mercedes-Benz, a dedicated team of professional luxury sales, service & parts staff. Why buy from or get your car serviced at Mercedes-Benz of El Paso? We'll for one we are your exclusive new & used Mercedes-Benz dealer in the area! We also offer services specifically designated for our luxury car customers. For ex. we offer a special concierge service to all our new Mercedes-Benz customers! If you need assistance pairing your phone with your new car for ex. our Mercedes-Benz of El Paso team member will stop by your home to help! With natural voice recognition and countless other innovations & standard features the new Mercedes-Benz A-Class sets a new baseline for the compact sedan segment. Your Mercedes-Benz of El Paso Service & Parts team is here for all your Mercedes-Benz service needs! Why? Because your Mercedes-Benz can't be serviced by just anybody. We have several Master Certified Mercedes-Benz Technicians who have gone through the proper training & certification process to know how to handle your Mercedes-Benz properly. In fact, on top of the rigorous training many of our Mercedes-Benz Service Technicians have worked for us for several years. 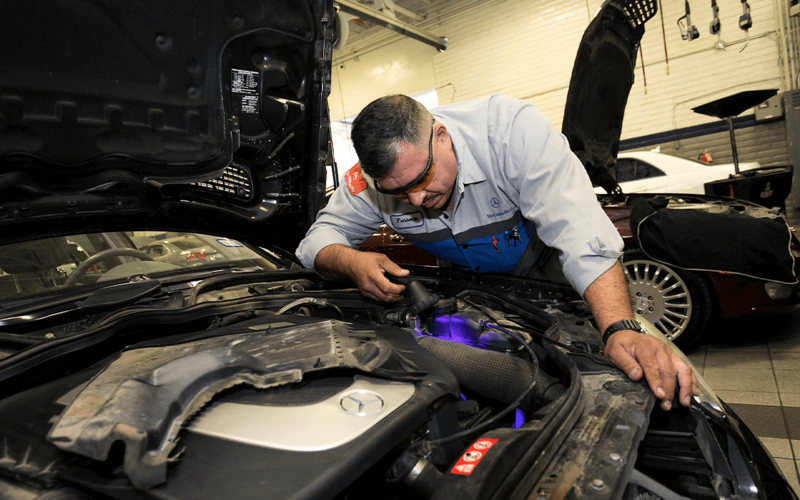 With years of experience servicing Mercedes-Benz cars & working with Mercedes-Benz customers in El Paso our technicians have the know how and service standards to exceed your typical service expectations. Not to mention, we offer a Mercedes-Benz owner concierge service to all our Mercedes-Benz customers, as well as, freshly baked cookies in our customer waiting area. Super experience with Mario. He made the entire process painless. I would strongly recommend Mario Machias to anyone looking for a good used vehicle. No one was bugging and I didn’t have to have a appointment to do a test drive. Staff was great and friendly! Thank you all! Natalie offers great customer service. She was extremely helpful but most of all very noce and welcoming since my forst visit to Mercedez. She kept in communication with me to notify me when the car I wanted arrived to El Paso and as soon as it got here I bought it. Will come with her in the future! The parts department work fast and proactive when faced with obstacle to provide a part that in the system was not the proper one for my car. Love the speed and personal care they performed on my visit. Jennifer Stockman is extremely talented and skilled at what she does, which is alot- yet customer service by far exceeded expectations. Give this woman a raise. Thank you for having people that still care. Whether you’re interested in the sporty, yet affordable luxury Mercedes-Benz C-Class sedan or the full-size luxury Mercedes-Benz GLS SUV, we have the luxury car you’ve been dreaming of. In fact, as Mercedes-Benz of El Paso, TX our speciality is providing you with the certified pre-owned luxury car of your needs. Contact us or stop by luxury car dealership in the area, Mercedes-Benz of El Paso, located off I-10 & Airway.